Filling your home with scented fragrances from wick-burning oil lamps can be expensive, but you can easily make your own scented oils for wick-burning lamps with flowers and herbs from your garden. Freshly-picked lavender, rosemary and spearmint make wonderfully aromatic oils, or you could create a more floral scent with gardenia, roses and jasmine. Experiment with different scents for your oils, combining subtle fragrances for therapeutic or aromatic purposes. You can find supplies for making scented lamp oil online or at your local aromatherapy supply store. Cut 3 cups of lavender from your garden. Cut the flowers just before they are completely open for best results. For other types of essential oils, use fragrant flowers that are in full bloom, but make sure that no pesticides have been used on the plant. Cut the lavender in the morning for the best fragrance. If you don't have a garden, purchase lavender or other scented flowers from your local natural florist or garden shop. You can also use spices and citrus peel for essential oils, following the same steps as for lavender and floral oil. Bruise the lavender flowers with a mortar and pestle. If you don't have a mortar and pestle, place the flowers in a plastic bag and roll over them with a rolling pin or a glass bottle. No matter how you do it, your goal is to bruise the flowers to bring out the natural fragrances. Open the Mason jar and add ½ cup of sweet, cold-pressed almond oil. Add the bruised lavender and seal tightly. Shake the jar vigorously to further bruise the flowers. Place the jar on a window sill or in a room with temperatures that range from 68 to 75 degrees F. Give the jar a good shake once every 24 hours for one week. Place the jar in a dark spot for at least another two weeks. This allows the oil to age and continue to absorb the lavender's essence. Do not shake the jar during these two weeks. Place cheese cloth over another clean Mason jar and strain the oil through the cheese cloth. This will catch the bits and pieces of the lavender. Squeeze the cheese cloth to get as much lavender oil as you can. Throw away the used lavender and the cheesecloth. Place your lavender essential oil in dark bottles, as light will affect the potency. Small dropper bottles are available for essential oil storage at aromatherapy supply stores online (see Resources). 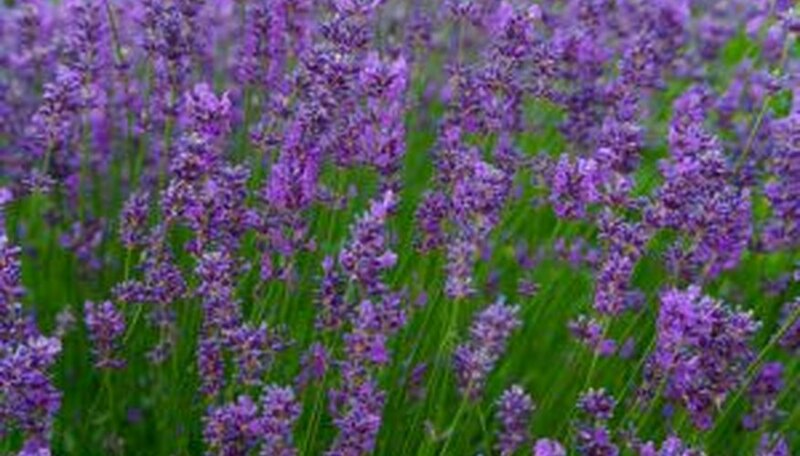 Add about 20 drops of your lavender oil to the unscented lamp oil in your wick burning lamp for a gentle lavender scent. Add more lavender oil if you prefer a stronger fragrance.